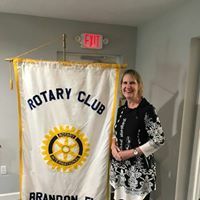 The Rotary Club of Brandon had a special guest speaker this past week as Mary Berg from A Kid's Place visited to educate our club on the thriving 501c3 non-profit and its good work. Mary talked about the challenges of operating the facility's frequently filled to capacity houses and the 60 children they are currently serving. A Kid's Place, which provides a loving home for abused, neglected or abandoned children was founded by Dottie Berger McKinnon as a place where children can be fostered without being separated from their siblings. Some of the ways that organizations like Rotary can help are to do things with the children, organize a field trip like bowling, or even do a facility project together with them. As for the club meeting, Sergeant At Arms Fred Schwabe was in prime form with every joke hitting its target. President Dave announced that the club will soon be inducting three more members to the club as Alexis Weaver, Todd Allen and Pat Skidmore II will all soon be Rotarians. A big reminder that our Bustin' Clays Clay Shoot is scheduled for Friday, September 29th at Fish Hawk Sporting Clays. Ryan Burley and Chris McGuire are primed and ready for an awesome event with tons of raffle items and a family barbecue waiting for all participants after the shoot. The club had a big impact at lunch today as well by raising $1,000 for the Sandy & George Simmons Riverview Boys and Girls Club's upcoming corn hole tournament. The Simmons family has been instrumental in our club's ability to have the event center, and our members wanted to show some of our appreciation by passing the hat and raising some much needed funds for the Boys & Girls Club. Way to go, Rotary Club of Brandon!! President Dave suggested to the club that our upcoming Fireside Chat be moved to the Rivard-Simmons Rotary Event Center due to a conflict with Rotary's Camp Florida and that it be a club social. Event chair Steve Moran will be leading this as a Filipino-Irish themed event with authentic cuisine, drinks and fun. All Rotarians, spouses and future Rotarians are invited for the October 10th event! This coming week is our club assembly and fundraising prep time.